Made a last min trip to KL for an important meeting (very fruitful). Closed 2 deals while traveling. Unfortunately, I cannot say what it is here yet but I am very excited! Still have 2 pending transactions, one looks like will have to close next week (during CNY) and one will definitely be after CNY. Miss my connecting flight due to snow delay in Chicago, I am now stuck in Miami waiting for the next day flight to Cartagena. Come to think about it, this is the first time I am in Miami. The weather is wonderful, a sharp contrast to the Beijing freezing wind and Chicago snow. But heck, I am in no mood to do anything else after 20 hours on 2 hops of planes, 3 hours in the queue trying to get my next flight. Bath and sleep…and hope I get to Cartagena tomorrow. There are many peaks of been a geek in China. One of which is to access to whole set of Made-in-China software that has no equivalence in the English speaking world. I was reformating my old Acer to run Windows 7. 1. It detect and recommend what Windows patches you need, and once you confirmed, automatically download (via P2P of cos) and install the patches. It runs constantly in the background and only pop-up when there is a new patches available. This feature alone outstrip what it is offered by Windows Update. In fact, this is the reason I installed 360 first before anything else, because it do a much better job. 2. It scan and monitors your PC configuration and make recommendation to optimize the PC and once you confirm, it does it automatically for you. It does simple things like checking for what temporary files scattered across your harddisk, what program you can stop running so it speed up your startup time etc. 3. It scan for malwares and if you like, it also has a free anti-software. I cannot compare this to other commercial anti-virus but it is good enough for me. 4. It has a software management, that recommends software you should download. It also it has an extremely powerful uninstaller (much better than what is offered Windows again) that it scan and delete all the left-over files and registries entries on your computer so you know you totally get rid of it. After I setup my new Win7, I found out I have lost my driver discs. Normally, this means I will have to head over to Acer, look through a whole set of links to find the relevant drivers, download them and install them one by one. Instead, there is another Chinese software I use DriveTheLife. What it does is that it automatically detect your hardware, the missing drivers, makes recommendation for you and with a click, it downloads, install and reboot for you. It save me hours of sitting in front of the computer to setup the drivers. btw, it continues to run and monitor updates for you if you like to keep it around. There are hundreds of these small software like this, not available in English, no equivalent in the English world, that makes me really happy sometimes I am a Chinese speaking geeks. I have been trying to keep a low profile since coming to China. In my early years in China, a 老前辈 had advised me that if I want to be successful in China, I must learn to 低调做人，高调做事. Anyway, to cut the long story short, I finally bent and accepted my first Chinese (video) interview, on the request of an old friend. I spend a morning at 光明网 a couple of days ago and did an hour long video interview. We spoke on many things and I don’t think I can remember every detail. Neither have they release the video yet. But I was quite surprised when they picked one of the things I said and put out as a news report. And more surprisingly, that is also picked up by others and now making rounds in Chinese news wire. I didn’t know about it until friend emailed me. Anyway, the news is about that the IDN ccTLD for China “.中国” is now activated in the root and therefore fully functional. The only mistake is that the article said it happens on 12th July when actually this was done on 9th July. I didn’t know if the mistake is mine (I think so) so I have to wait for them to release the edited video interview. * Therefore, it is RESOLVED, (2010.04.22.10), that CNNIC be notified that the .中国 (xn--fiqs8S) and .中國 (xn--fiqz9S) IDN ccTLD request has completed the Fast Track String Evaluation and that they may enter the String Delegation step in the Fast Track Process, using the standard IANA ccTLD delegation function, and that delegation is contingent on completion of the IANA process criteria and publication of CNNIC’s detailed Implementation Plan to be finalized in consultation with ICANN. * Therefore, it is RESOLVED, (2010.04.22.11), that TWNIC be notified that .台灣 (xn--kpry57d) and .台湾 (xn--kprw13d) IDN ccTLD request has completed the Fast Track String Evaluation and that they may enter the String Delegation step in the Fast Track Process, using the standard IANA ccTLD delegation function, and that delegation is contingent on completion of the IANA process criteria and publication of TWNIC’s detailed Implementation Plan to be finalized in consultation with ICANN. US strategy towards China has been particularly confusing to many people. It is strange that the two major economic power of the world today would taunt each another in so many different issues. This UK Guardian article nicely summarized the situation. This dysfunctional, agitating approach to Sino-US negotiations and communications only continues to erode the relationship between the two countries, which has already been weakened recently as a result of US comments over internet censorship and the sale of arms to Taiwan. This should not become the normal way for the two nations to engage, particularly when it comes to bilateral issues. One obvious difference between US and China is the ‘Culture Differences’. ‘Culture differences’ is often used to explain the disagreement but seldom really understood. The background and construct of the political system between the two country couldn’t be greater, that leads to misunderstanding and mistrust. (1) I am still trying to figure out what part of my work in China can I blog and which I can’t. Even the fact that I met so-and-so may not be something I can put on the blog up here – culture differences. (2) I have only been in China in-and-out for 10 years and really stayed here for a year plus. The longer I stayed in China, the less I seem to know about it. I don’t like to blog about China as-if I am an expert. There are enough “China expert-bloggers” to fill that need. 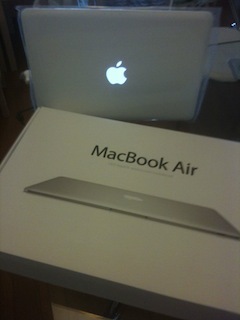 Anyway, this shanzhai Macbook Air is what I bring me back for a min. It is too good not to blog about it. It is one of the best “shanzhai” machine I seen in China. Except for the white plastic casing, the moulding is exactly like an Macbook Air – I can use my Macbook keyboard protector and it fits perfectly. The packaging looks and feels like from Apple. There is even a remote control which actually works pretty well! 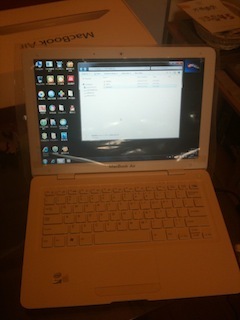 The specs is decent – N280 Atom 1.6Ghz, Intel 945M, 2GB RAM, 320GB harddisk, 4 cell batteries, win7 – what you expect from a standard netbook. Lee Felsenstein and his wife Lena. Meet them last year in Bay Area via Nick Palevsky. 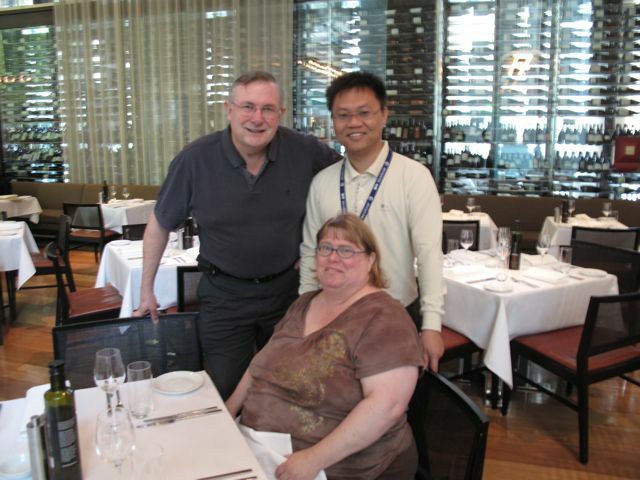 They are in Sydney to give a talk on OLPC and I am here for ICANN.